When Drs. 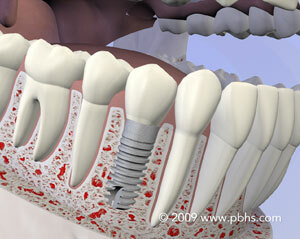 Blecha and Jandali first started to practice dental implants had poor long-term success. Restorative dentists were asked to do heroic measures to try to salvage teeth that had a poor prognosis. Teeth were only removed as a measure of last resort. Often when they were removed terrible bone loss was present about these teeth. Today dental implants are much more reliable than were the heroic measures used to try to save these teeth. Thus the field of dental care has evolved to where teeth with a poor prognosis are removed hopefully before all of the bone has been lost. Preservation of the bone is just as important as preservation of the tooth. Patients are living longer today, but there dental needs have not changed. Dental decay and teeth breakdown often increases as patients’ age. Preservation of the teeth, bone and ”bite” are thus even more valuable today. 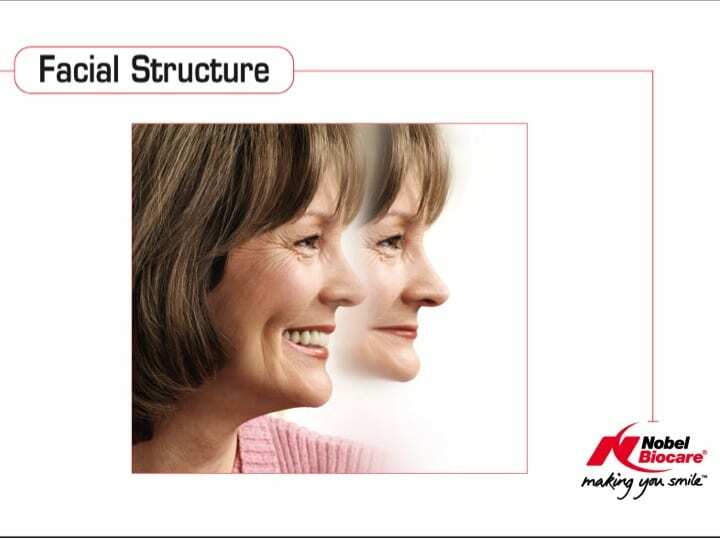 Fortunately, dental implants do not get decay. They are also very resistant to periodontal (gum) disease. Are dental implants always the best solution? The answer is that it depends on the individual case. If Drs. Blecha and Jandali feels that a patient is better off to do a bridge rather than an implant he will advise the patient of this. Your restorative dentist and Drs. Blecha and Jandali will provide you with options so that you can make the most informed decision concerning your tooth replacement. Call Naperville Oral, Maxillofacial and Implant Dentistry Phone Number 630-961-5151 to schedule a consultation with Drs. Blecha and Jandali. 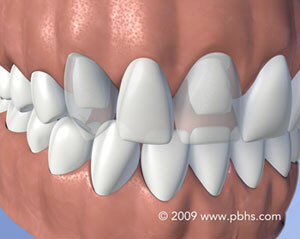 There are both temporary and long lasting solutions to missing teeth. 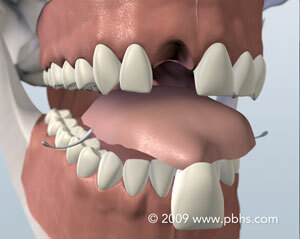 Temporary teeth would include a flipper (shown below) or Essix retainer if one or several teeth are missing. The flipper is made of pink acrylic that supports temporary teeth and often has clasps to hold it in place. The Essix retainer is similar to an orthodontic clear retainer that covers all of the teeth but adds tooth colored teeth where teeth are missing. A temporary denture can also be used if one is losing all of the teeth on one jaw. 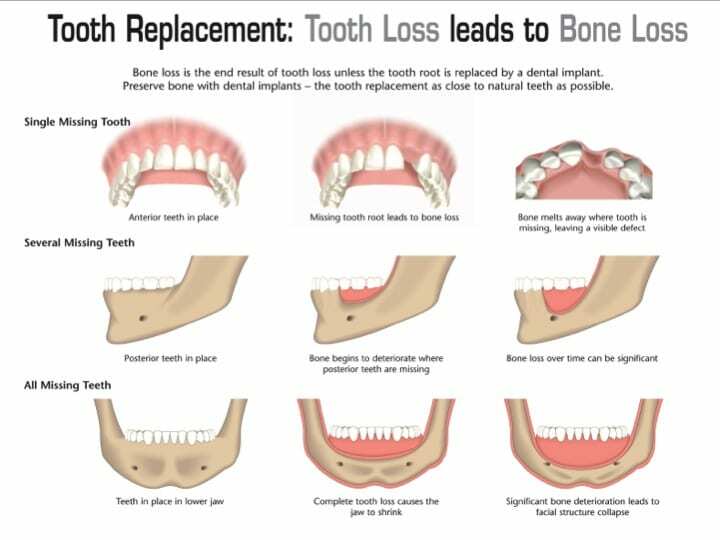 Longer lasting tooth replacements for patients missing one or several teeth would include a removable partial denture, a fixed bridge, or dental implants. The partial denture is the simplest, quickest easiest solution. It is removable which is good because you can clean your other teeth. However food can get trapped beneath it, which is annoying. 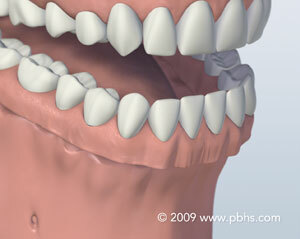 The partial also has clasps that tend to torque on the adjacent teeth that may eventually cause these teeth to be lost. 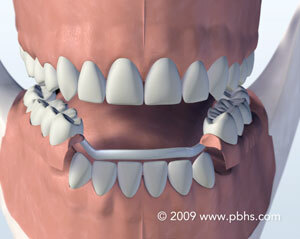 The fixed bridge involves removal of tooth structure on the adjacent teeth so that “caps” on the adjacent teeth to be replaced can support the false missing tooth (teeth). The longevity of the bridge is then dependent upon these teeth being strong enough to support the missing teeth and also that these teeth remain free of tooth decay. Typically the dental implant solution does not attach to the adjacent teeth and the implants are the only support for the teeth. In the past, patients missing all of their teeth either wore a denture or if they could not tolerate a denture they would wear no teeth at all. Full dentures are a long-term solution for patients missing all of their teeth but they should be remade every 7 years as the bone beneath the dentures steadily shrinks away and thus the denture does not fit well. Dental implants can be used to stabilize a removable denture or they can even be used to support fixed teeth that are only removed by the dentist. There are several reasons to consider implants. 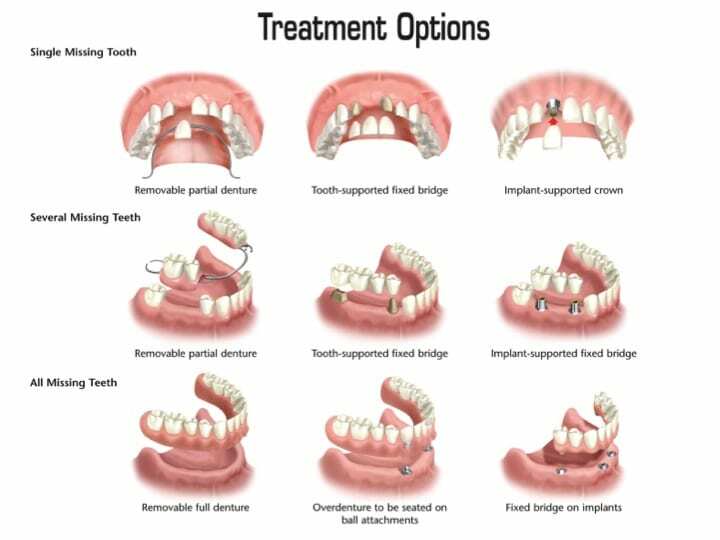 If you are missing one or several teeth implants allow you to avoid removal of tooth structure on the adjacent teeth that is needed for a bridge. Teeth that are prepared for a bridge are often more susceptible to get dental decay under the bridge once the bridge is placed. Teeth that support a bridge are subject to much greater bite force with chewing, which could result in these teeth eventually breaking down. However there is still a role today for a dental bridge but it is case specific.